Watch out Apple, here comes Nexus One, the Google phone the tech world has been salivating for. Over the weekend Google set off a fury of speculation when employees tweeted they were testing a new Android-based mobile device. Google later ratcheted up the Google phone buzz when in a blog post it confirmed it was testing a handset with "innovative hardware" from one of its partners. 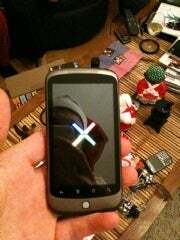 Said to be named Nexus One, many critics believe this device will give the iPhone a run for its money. Following that revealing Google blog post about the Nexus One, it didn't take long for photos and details about the device to leak. Many of those who claim to be familiar with Google's plans say the Google phone would be an unlocked GSM device running the Android 2.1 mobile operating system. Google, they claim, would sell directly to customers with no wireless carrier subsidy. The device could go an sale as early as this January. That's the basic information, most of which has been reported before. Google has officially confirmed little beyond the devices existence. We are still waiting for Google to officially share more about its phone. In the interim, here is the latest speculation about Google's purported device. The Google phone is believed to be an unlocked device that Google would sell directly to customers. Nevertheless, Google still wants to work with the big mobile carriers, and T-Mobile may have some kind of role in the launch, according to AllThingsD's Peter Kafka. Google may also be considering some unconventional ideas for selling the phone. One possible scenario, according to Kafka, would have you select your carrier from a menu when purchasing the phone from Google's dedicated site. If Google does offer a menu of phone providers at purchase time, then perhaps T-Mobile will the recommended carrier for U.S. and European customers. This may also suggest that, even though the phone is unlocked, you will still be able to get a subsidized phone with a two-year contract. Unless Google becomes really unconventional and tries to subsidize the phone with advertising. There is still some debate over the name of the supposed Google phone, such as Passion, but all signs are starting to point to Nexus One as the official moniker. Early Monday, Engadget uncovered a compliance report created by HTC for the FCC. The report reveals some details about a quad-band GSM smartphone called the NexusOne. Numerous reports based on unnamed sources have also said that Nexus One will be the name. For all you tech die hards out there, you can read all 90 pages of HTC's NexusOne report to the FCC for yourself. (PDF download). Specs are hard to come by, but based on reports by Engadget and others, this device will probably have a screen slightly longer than the iPhone's (just under 5 inches), OLED display, trackball, 802.11b/g Wi-Fi and Bluetooth 2.1 connectivity, and a microSD expansion slot. The device is also believed to be thinner than the iPhone. Rumors are suggesting the device would be launched by Google in early January, but there's also speculation the Nexus One/Google phone could just be a test device for trying out the latest Android platform. It's also possible that Google could be developing the hardware and software, but wouldn't produce or brand the device. Instead, the company could license its design out to other manufacturers, a very Microsoft-like move. The Google phone's help pages supposedly points to a dead link at Google.com/phone/support. Keep your eye on that Web page as January approaches. So will Google be launching a phone next month? The strongest rumors sure seem to be pointing that way, but as always there's no guarantee. Firm details confirming that Google would launch the Nexus One/Google phone on its own are still pretty scarce . There are also a lot of arguments against Google coming up with its own device. The primary one being that if Google produced its own device, it could scare off or upset Google's Android converts such as Motorola and HTC. Nevertheless, a Google-developed phone could be an interesting addition to the continuing smartphone battle. What do you think, is the Google phone the real deal? If so, will you be buying one?